These Pet Rescue level 681 cheats and tips will help you beat level 681 of Pet Rescue. The objective of Pet Rescue level 681 is to rescue 14 pets and get 15,000 points. 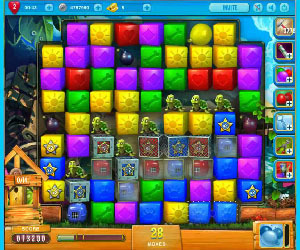 For Pet Rescue Saga level 281, focus your early moves on the last two rows. First, you need to clear the bottom row of blocks so your animal carriers can get down. Then, you’ll need to get like colored blocks near those animal carriers to open them. You need to drop those glassed in animals carriers asap. The balloons will come in handy here, so make sure to use them quickly to recharge them. Use the balloons to remove bottom rowed blocks. You should also use them to open you animal carriers. Remember to always open the color the features the most carriers. Luckily, bombs are going to drop from the top of the level. The will serve you well for trying to open up the bottom of the board, not to mention opening any hard to match carriers.